A Lot To Do Back Then! Before starting my vegetable plot I had to get rid of about 2 skip loads of part burnt rubbish, a mountain of broken glass - mostly an old greenhouse that had been buried. The problem was there is no direct access to the plot as it is at the bottom of my very long garden. All the rubbish going out and the good stuff coming in has to go through the house. 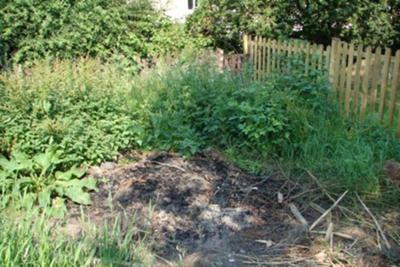 I then had to clear away lots and lots of couch grass. All the time thinking of the goodies that my new vegetable garden was going to be growing. It is nearly 30 years since I last grew any vegetables. As a landscape gardener who installs timber raised garden beds I know just how much work it takes to get these gardens up to scratch, well done! I know The Feeling Bernard! When I first started growing vegetables I too can remember removing 2 or 3 skip loads of rubbish - mainly stones. So well done on you determination! But you beat me in having to take it all through the house - I presume you did this on dry sunny days :o). I hope we get to hear what and how you've been growing vegetables.